Can You Taste the Culture, Art and the Beautiful Struggle in the Fruitvale? 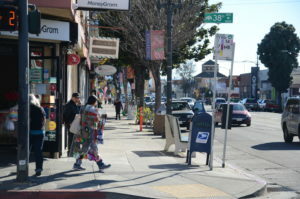 My neighborhood – the Fruitvale – is the heart Oakland’s District 5; the sense of community and culture are undeniable as you walk down International Boulevard from Fruitvale Avenue up to High Street. 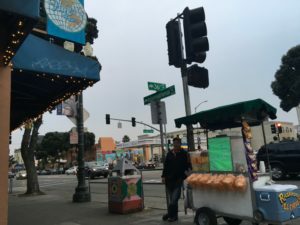 Eloteros, paleteros and vendors on International Boulevard sell to passersby while mom and pop shops offer a taste of the Latino culture that represents our neighborhood. My neighborhood has been home to an almost entirely Hispanic and Black community over the past decades; recently, a wave of gentrification has threatened residents and small business owners alike. The vibrant culture and accessibility to the rest of the Bay Area have made Fruitvale one of the most desired neighborhoods by newcomers with wealth, gentrifiers, who make it impossible for families to stay. “Yo he vivido en este barrio por mas de 25 años; caminando mi carrito de frutas y siempre he podido con las rentas… Pero ahora, se me dificulta sacar para un mes de renta y para otros necessidades,” said Santiago. 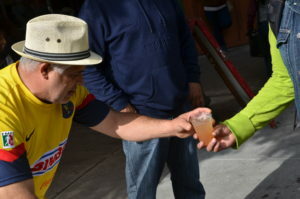 As he prepares a cup of sandia and mango for one of his daily customers, he shares that he has been a successful merchant in the Fruitvale area for over 25 years. Today, he is one of the many neighbors impacted by gentrification, barely able to pay for rent and other living necessities. Talking to Santiago, and walking by his fruit cart everyday on my way home from school as he converses with neighbors, it was clear to me the value that he adds to my neighborhood: culture and the beautiful immigrant struggle. Fruitvale. My neighborhood represents a people’s struggle – and is a home for those hungry for knowledge, self improvement and community growth. A four-minute walk from home will take me to the newly -refurbished Cesar Chavez Park on 38th Avenue to practice my soccer skills on the tiny synthetic soccer field, or it can take me to school: ARISE High School, or to volunteer at Cesar Chavez Library or to protest in the Fruitvale Plaza: Avenida de La Fuente for movements that matter to our community. 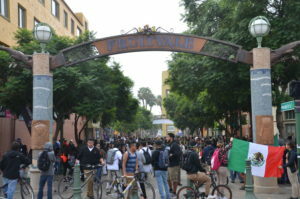 The Fruitvale Plaza holds a lot of sentiment for the people who live here and is the center of many demonstrations that have occurred in Oakland since the terrible death of Oscar Grant at the hands of BART Police in 2009. Most recently, it was the scene of a student- led walkout that was organized by Oakland students to protest President -Elect Donald Trump. In addition to the people and the culture that my neighborhood offers, the Fruitvale like, many locations in Oakland, is peppered with artwork. From trash bins at intersections to the walls of small businesses that support local artists. ARISE High School is also a great contributor of socially -conscious art work in the Fruitvale Plaza. Again, the art is a great representation of the culture of my neighborhood. While my neighborhood seems to promise a lot for its residents, many neighbors and small business owners worry that the planned city improvements might contribute to even more displacement and a lack of business. These projects include the Bus Rapid Transit, a light rail rapid transit along International Boulevard that will effect parking for small businesses as well as the Fruitvale Village Phase 2 which will create a huge housing complex in the parking lot at E. 12th Street and 37th Avenue. We hope that these projects will not hugely impact our already great community and neighborhood.